masharella: instant mash potato vegan mozzarella! Today I am going to talk to you about my new vegan mozzarella cheese made with instant mash potato: I decided to call my new baby ‘masharella’. Don’t you think it’s cute? There are culinary experiments that will never be shared by food bloggers because they turn out a disaster, others instead are just too good and exciting and need to be shared pretty much immediately with the entire world. 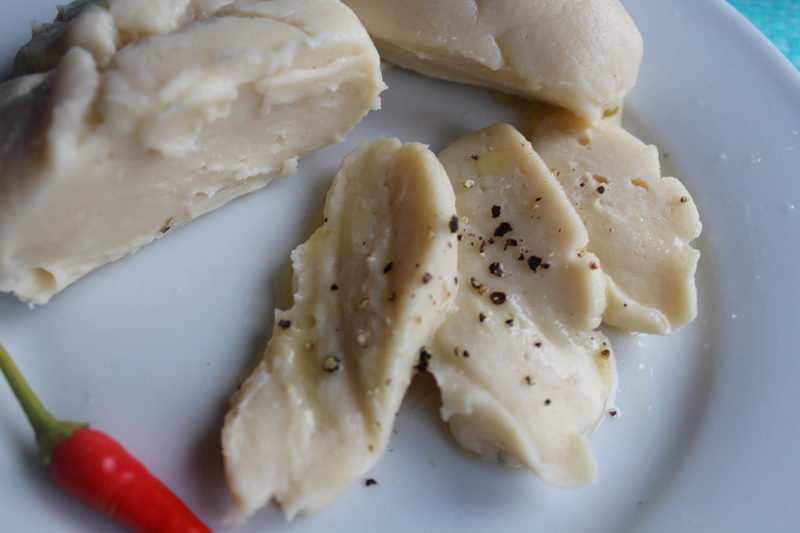 Well this is the case with masharella, sweet as vegan experiment to create a tasty vegan mozzarella cheese! I have just tried masharella in a caprese salad and it has a delicate and very pleasant taste, neutral but not bland and I can’t wait to try it toasted with bread and avocado or on pizza. I have just tried to heat it up in the microwave for a few seconds before writing this article and it stretched and was even tastier! Awww I feel like a proud mama! Well done masharella, well done. I hope you guys are going to give it a go, as it’s really easy and you don’t need hard to find ingredients. This recipe took me about 20 minutes, plus the time for resting in the fridge (at least a couple of hours). The more hours it rests, the better it tastes. The first thing you need to do is locate where to buy a brand of instant mash potato flakes that is also vegan. I added all the ingredients in a bowl and mixed until I obtained a creamy texture, although not quite smooth. Now the fun part: I prepared a bowl of water with ice cubes, then wrapped the desired amount of masharella into a piece of cling film and form a ball, firmly twisting the top of the film to secure it and placed in the iced water. Repeat until the masharella paste is finished. Leave for 10 minutes then place the vegan mozzarella balls on a plate to rest in the fridge for at least two hours, still wrapped in the cling film. When ready, unwrap the masharella and eat the hell out of it! Now I am sure you all want to know my masharella vegan mozzarella cheese recipe so I leave you with this, as always I look forward to hear your thoughts! half a cup of unsweetened soy milk, add more if the mix is too thick. Needs to have the consistency of a thick cream. Create the masharella balls by forming the mixture into balls by wrapping it into cling film, and then placing into iced water for at least 10 minutes. Remove from water and let rest in the fridge for at least 2 hours. Here you have your delicious masharella! Serve in caprese salads, toasts, even on pizza. Enjoy! Good luck saving for your Italy trip! I’m sure your parents will be impressed when you get to show off to them some good old vegan Masherella!!! Would it become more “cheesy” if you added some Nutritional Yeast flakes to it? This looks amazing! I’m still gathering ingredients, is corn flour the same as cornstarch? Hello Tara, I look forward to hear your feedback on masharella cheeze! Yes cornflour or starch are the same sorry! No worries, I’m so excited to try this recipe and I want to get it right. One more question, I haven’t found agar powder, any chance I can use xantham gum in place of agar powder? Thank you! INSTANT POT: my favourite vegan kitchen appliance! Check the reviews! Vegan bacon rice paper facon vacon. mmm…Vacon! I can’t believe you can make vegan instant pot wine! custom pet dog cat portrait: my new Etsy shop now open for commissions! Vegans of the World is on facebook too! Send us your story! I have heard amazing things about these soy curls!